Can the mind survive the death of the brain? A skeptic and a believer debate the meaning of close encounters at the edge of death. 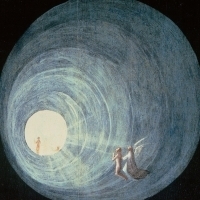 For many of us, tales of white lights, tunnels and journeys to other worlds offer hope – hope that death is not the end, hope that we will see friends and family who have died before us, hope that life has meaning beyond the length of our human days. And for scientists, near-death experiences tap into one of the great mysteries of our day: what is consciousness? Can the mind operate when the brain is off-line – and does that suggest a soul? Those are the questions we’ll wrestle with this week, with NPR’s former religion correspondant, Barbara Bradley Hagerty. We’ll talk with a doctor whose time in the trenches persuades him that there is more than this human existence, and a skeptic who thinks that near death experiences are merely the trick of a dying brain. We begin with the story of Edward Salisbury, a man who has suffered, or enjoyed, three close calls with death. From 2016. For desert-dwelling Muslims, Heaven was a lush, green garden, filled with springs, rivers and flowing wine. For ancient Jews it was the site of their holy temple, rebuilt brand new after its destruction by the Romans. And for African-American slaves, Heaven was the place where "the first would be last, and the last would be first.” In our 2010 interview, journalist Lisa Miller explains why our image of eternity is shaped by our life on Earth now - a reflection of our hopes, anxieties and longings for justice.